Welcome to Beautelle, the leading British manufacturer of specialist therapy, beauty and medical equipment. As leading providers to therapy and healthcare markets quality has been the focus of the our business from the very beginning and we believe that this differentiates our equipment from other brands. We offer the professional practitioner an exclusive and extensive range of equipment to meet the needs of different treatment regimes encompassing therapy, beauty and medical healthcare. Ergonomic stool design is playing an ever-important role in the wellbeing of the seated therapist, technician and beautician. More and more therapists suffer with back and posture problems. The chairs or stools they sit on to give a treatment can be a contributing factor to poor posture which has resulted in Beautelle’s popular ergonomic seating range ever increasing! Recommended by orthopaedic specialists, physiotherapists and occupational therapists, the Burley Saddle Stool is proven to reduce work related upper limb disorders(RSI), decrease pain and fatigue associated with muscular tension, reduce lower back pain, relieve posture problems and improve blood circulation. 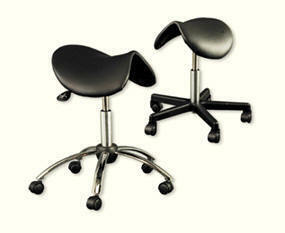 Beautelle’s saddle stools provide correct posture and support allowing the spine to maintain its physiological curves. Prices start at a comfortable £100+vat. The shape of a Beautelle Saddle Seat maintains your natural spinal curve as you sit, stretch or lean forward ...Sitting on a saddle seat maintains the natural 'S' shape of the spine. A leading British manufacturer of one of the best known brands of specialist therapy, beauty and medical equipment.If its quality couches and equipment you are looking for Beautelle are one of the few remaining genuine British manufacturers that make your equipment for you, here in the UK. Take advantage of a huge choice from one of the top brands of therapy/beauty and medical/health equipment and have your couches custom built to your own requirements.